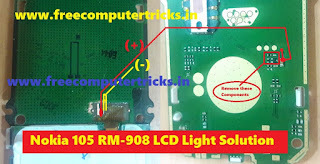 How to find the Nokia 105 RM-908 LCD light complete ways? If Nokia 105 Display or LCD is OK but there is no light in the LCD then you may need the proper and 100% working solution to find out the right LCD light points. Here you will know how to solve LCD light problem on your Nokia 105 and how to find out the LCD light Positive (+) and Negative (-) point on the Nokia 105 PCB. With this solution you can turn on the LCD without transistor and resistor. Remove the LCD transistor and 2 resistor ( See the above Image). Then short the 3 and 4 LCD leg connector (It must be the Negative (-) Point of LCD). Now make a jumper from the LCD 2 leg to the LCD Light capacitor. If not success then make a small jumper from the Capacitor to the light timing point (The point is on the 105 PCB just below the Capacitor). Now switch on the Nokia 105 and the LCD is working fine. So in this way you can solve the Nokia 105 LCD light by making jumper from LCD to the mobile motherboard light section.